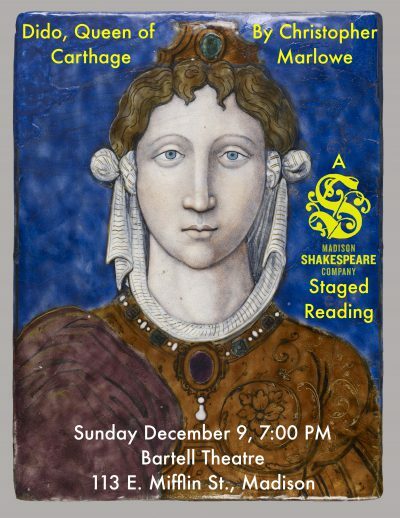 A staged reading of the rarely seen Dido, Queen of Carthage by Christopher Marlowe. Troy has fallen. A small band of survivors are reunited near Carthage, a peaceful refuge. But the gods are restless, indifferent, and unkind. They craft love triangle after love triangle for their own amusement, and soon Carthage is in chaos. Featuring Kiki Moritsugu (Doctor Faustus) as Dido and Ari Pollack (Henry the Fourth) as Aeneas. Dido, Queen of Carthage will be presented on the Evjue Stage.